Before I start this blog post, I just want to give a shout out to the Ratpack forum and especially the users that contribute to the forum. When I finished my code for this post, I posted it to the forum in hopes of receiving some criticism so that I could tweak it before writing an article about. At most, I expected a comment or two along the lines of, "Yah, XYZ is OK but you could maybe try it this way instead." In other words, helpful but not too helpful. The next day, Luke Daley had forked my project (his fork is here) and made some major improvements. He was also available to answer a few questions I had about his changes. I already thanked him profusely on the forum, but I just wanted to offer my thanks again - it's communities like this that make me really enjoy working with new (to me) technology. So, without further ado, let's get into it.. This article is running a lot longer than I expected it to, so I'm going to break it into two parts. The first (this one) will be about the Ratpack application and the second will describe the AngularJS side of things. You can find the Angular portion of this series here. Our project structure is standard for a Gradle Ratpack app. Within the src directory, we have two directories: main and ratpack. main has plenty of subdirectories, but only one actual file - our service for processing the uploaded images. In ratpack/public, we have everything we need for the Angular app. And finally, in the root of ratpack, we have our Ratpack.groovy and ratpack.properties files. The build.gradle script is pretty standard in this project, so I'm not going to go through it step by step. You can click here to view the file in its entirety. As far as I can tell, Netty's default maximum content length - that is, the amount of data we can send in a request - is 1,048,576 bytes. This would limit us to just about 1 MB file sizes for image uploads. By changing this setting, we're bumping the maximum content length to about 5 MB, allowing us to send some bigger photos along. Finally, some actual code! We'll start off with some basic imports. The ImageService class is used for both processing the uploaded images as well as providing a list of currently available images. Form is used by Ratpack to (you guessed it!) parse incoming form data. JacksonModule and Jackson.json will be used to render JSON for the client. Finally, ratpack.groovy.Groovy.ratpack is required for us to actually build the app. Next up, we have some variables that will be used throughout our handlers to tell ImageService where to put uploaded files and to tell Angular where it can find the files. I'm not exactly excited about storing these config options here, but for the purposes of this project, it works. One important thing to note about these folder paths is that they are relative to Ratpack.groovy. Our full path to the uploaded-files directory is /src/ratpack/public/uploaded-files, but we only need to specify /public/uploaded-files. Within the ratpack closure, we first need to tell Guice (the DI framework) about the modules and bindings we're going to be using. In this case, we only need to add one module. The ImageService class will also be managed by Guice, but it does not have its own module - that will be explained a little bit later in the article. In addition to the module binding, we can include an init closure to execute action(s) once the injector has been finalized (source). Basically, the init block will only run a single time once the application has started. In this case, we're going to use it to create our upload directory if it doesn't already exist. LaunchConfig has a lot of useful information about our application, and here we're using it to grab the base directory. We're now serving up our assets directory, complete with an index file, and our two API endpoints. The assets method tells Ratpack to servce static assets from the assetsPath (defined as "public") and to serve the index.html file as the index for that directory. Put simply, it lets us navigate to http://localhost:5050 (or wherever you're hosting) and have index.html delivered right to us. Our endpoints are configured using the prefix closure, which allows us to nest handlers that should be prefixed by whatever we've defined as the prefix. Our prefix is "image," so every handler defined inside the closure will be accessed via http://localhost:5050/image/, followed by the handler's path. The first handler within the prefix closure is a get handler. With no path defined, the URL for this endpoint will be http://localhost:5050/image. The endpoint will only respond to GET requests - anything else will result in Ratpack returning a 405 (Method Not Allowed) status. Later, we'll populate this handler with a call to ImageService to grab a list of all the uploaded images and send them to the client. The second handler is a post handler with a path defined. It functions similarly to the get handler, except it will only accept POST requests. Additionally, because we defined a path ("upload"), the endpoint will be http://localhost:5050/image/upload. 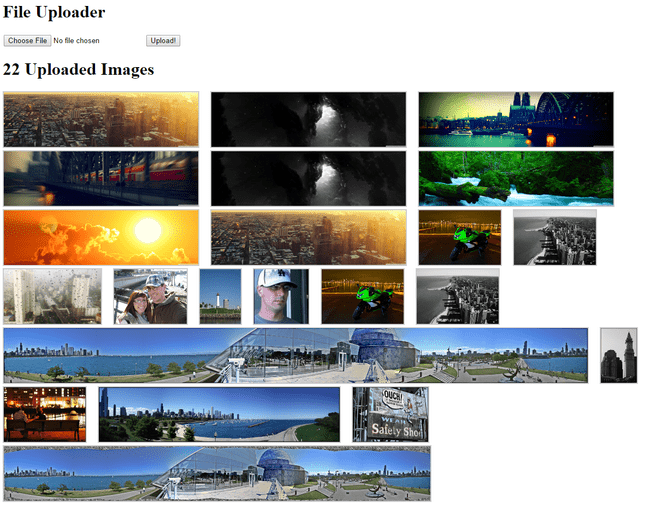 We'll use this handler to send the uploaded image to ImageService for processing. So, how do we get access to ImageService within our handlers? If you remember from earlier in the post, we don't have a module for it so we were unable to add it in the bindings closure. We could always just new it up, but that's not necessary - the prefix handler uses Guice's just-in-time bindings, which means that injecting the service is as simple as declaring it as an argument to the closure. One caveat to the JIT bindings is that they are only availabe on the prefix handler (source) - you won't be able to use them on any of the other handlers such as get or post. Before we start filling out our handlers, we need to grab a reference to the image and thumbnail directories because we'll be passing them in to ImageService. The get handler is nice and easy - we'll just make a call to getUploadedImages, which returns a promise. Once the promise is resolved, we'll receive a list of image filenames. We'll use the Ratpack context.render method to send the list of filenames and the location of the files back to the client. Promises are important to Ratpack because it's designed to function asynchronously. By wrapping our blocking code - such as file or database operations - in a promise, we can take advantage of the performance gains inherent to Ratpack's asynchronous design. Our post handler will use the context.parse method to read the incoming POST request into a Form. The Form class is basically a map with a handful of convenience methods for working with uploaded files. Once we've parsed the form, we can use form.file( formFieldName ) to grab a reference to the uploaded file (represented as an UploadedFile). Once we've got the file, we need to verify that the file being uploaded is an image and, if it is an image, process it, and if not, return an error to the client. response.status(400).send "Invalid file type. Images only!" And with that, our Ratpack configuration is complete. You can view Ratpack.groovy in its entirety here. ImageService only has a handful of methods, so we'll just run through them quickly. As always, you can view the entire file here. First up is the constructor, which is annotated with @Inject and expecting a single argument: an instance of ExecControl that will be injected by Guice. ExecControl is what gives us the ability to use Ratpack's promises. The UploadedFile class provides us with easy access to the content type (e.g. "image/jpeg") which makes it very easy to do a simple type check. UploadedFile (via TypedData) provides a few ways for us to access the file contents: as raw data in a ByteBuf, as raw data as bytes (byte), or as an InputStream. In this case, we're using the input stream to read the file into a BufferedImage. Next up, we'll use ExecControl to wrap a blocking interaction with a promise in getUploadedImages. This method returns a list of all the file names found in the application's image directory. As an aside, Groovy is freakin' awesome: look at that one liner to get the list. The code to retrieve the list was five lines long before Luke got his hands on it, and I can't complain. Processing the image consists of grabbing a unique file name and then saving off both the full size image and the thumbnail. Once again, we're utilizing promises. The actual saving is pretty boring - we just use ImageIO to write the image file to disk. In the case of the thumbnail, we use imgscalr to resize it by setting the height to 100 pixels and then turn around and call saveImage() with the thumbnail. That concludes the Ratpack/Groovy portion of our application. I'll describe the AngularJS app in part two, here. As always, please feel free to leave your comments and criticisms below!